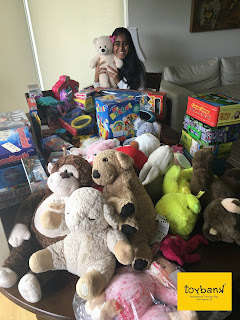 Toybank Delhi is on a roll! We set up the 2nd toy library in Delhi/NCR area at Protsahan Foundation on 4th of August! Our volunteers had visited children from Protsahan in May 2011 to celebrate Toybank Delhi's 1st year anniversary! This time we took along amazing toys to help Protsahan run Toybank's toy library at their centre. "On behalf of Protsahan team and the children, I would like to thank Toybank for setting up the Toy Library at Protsahan premises. 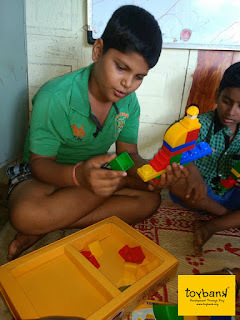 - Kids are learning to spell and make small words with the game 'Fun with Words'. All the games are enhancing their learning capacity. - 'Spellex' a crossword game, is the most favourite game among all the children." "This was a very novel experience for me as this was just my second time working with kids of this age. I had a lot of fun playing with the them and teaching them some of the games. The kids were pretty intelligent and smart. I was a little apprehensive about my abilities to entertain and engage the children at the starting of the event, but the event went exceptionally well as the children seemed to enjoy it. I really enjoyed being a part of the event as well." "It was wonderful to interact with young girls and watch them play, sing and smile! It was amazing how Protsahan raised those little girls into playful birdies! Nishant and I had scrounged the entire store place, opening every carton, every bag, to find some of the best toys we have. I guess it was all worth it because the toy collection turned out to be way more engaging than the last time! The girls loved playing with the hoopla rings, the monkey game, puzzles and more. However, Jean's catchy rhymes stood out that day! Girls enjoyed singing with her thoroughly. And we all sang along too, making it a day to remember always. :) "
"This was my second experience playing with the children. First of all, I really appreciate the effort by Protsahan in how they have brought up the life of the young girls. It was unbelievable to see their enthusiasm while enjoying the poem recitation. Secondly, we had a lot of fun playing with toys, especially the 'Jumping Monkeys' and 'Hoopla'. It felt amazing to have made their day, yet again." "Just want to thank Toybank team for giving me an opportunity to be a child once again. The excitement of each one of these kids is highly contagious and I always take this feeling back home. Do keep me posted on your upcoming events and I promise to look at more innovative ways to engage the bachha gang :)"